Jay and I left Manila around 7AM and headed straight to Pilar, Bataan where his aunt and his other relatives live. From my personal viewpoint, life in Bataan seemed simple and straightforward, far from the stressful and complicated environment of Imperial Manila. But little did I know that sixty years ago, this seemingly quiet province experienced the worst and Bataan has a story to tell to every first-time travelers like me. 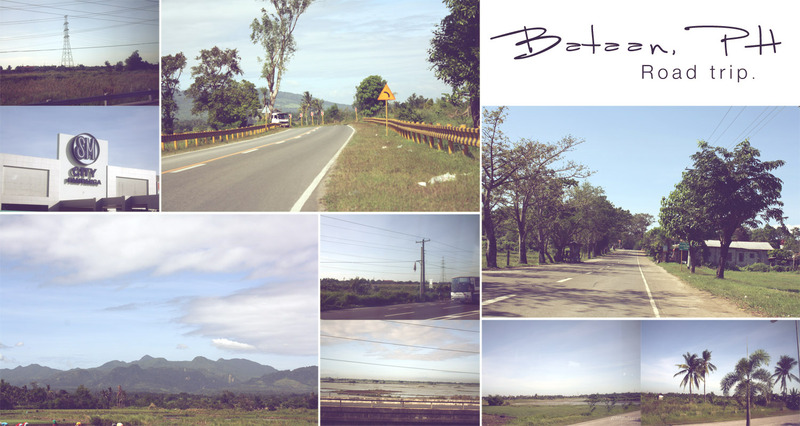 On our way to the beautiful province of Bataan! Manong driver drove his tricycle at top speed; going to the summit felt like I was riding a roller coaster! Lorjeesaas help me! Manong driver drove so fast that I can't even take a decent shot on our way to the summit! We finally reached the summit. Of course, picture-picture muna! Located in an area approximately 73,665 hectares, construction of the memorial shrine complex started on April 16, 1966 with the laying of the cornerstone by then President Ferdinand Marcos. Originally planned to be inaugurated in 1967, the memorial shrine complex was completed and inaugurated in 1970 in line with the 25th Anniversary of the end of World War II. The park consists of a colonnade and at the peak of the mountain, the Memorial Cross. The shrine was designed by Lorenzo del Castillo and landscaped by Dolly Quimbo-Perez. We first explored the Memorial Cross. An elevator will take you to the viewing deck. 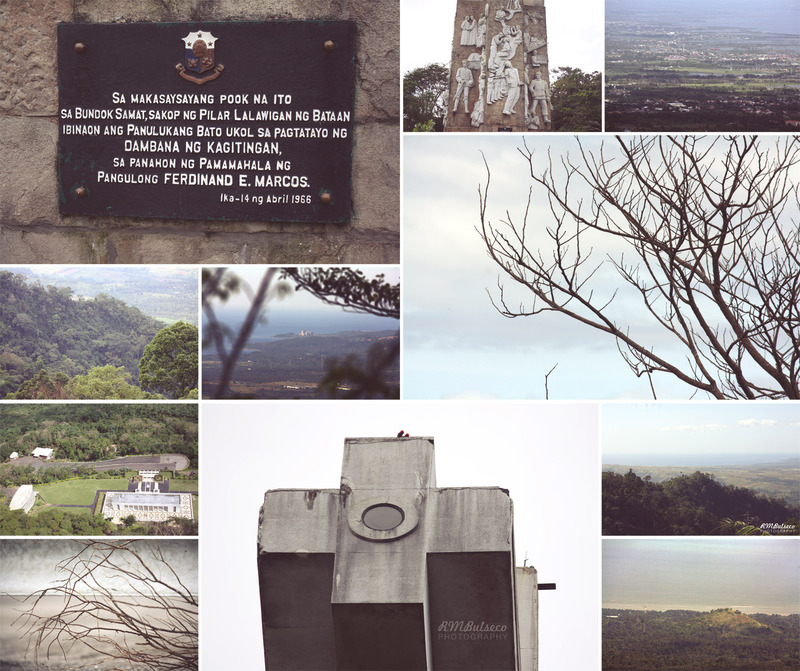 The Memorial Cross is the most prominent structure of the park and is located at the highest point of Mount Samat, 555 meters (1,821 ft) above sea level. 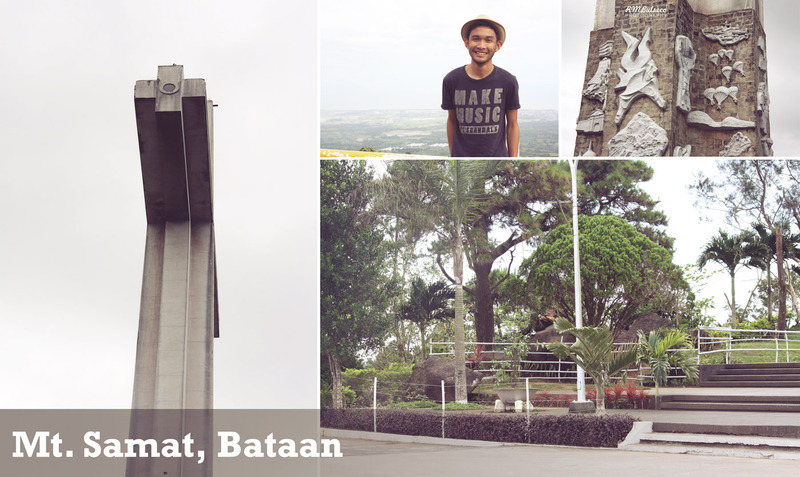 Made of steel and reinforced concrete and stands at 92 meters (302 meters) from the base, the Memorial Cross offers a breathtaking view of the whole province of Bataan. 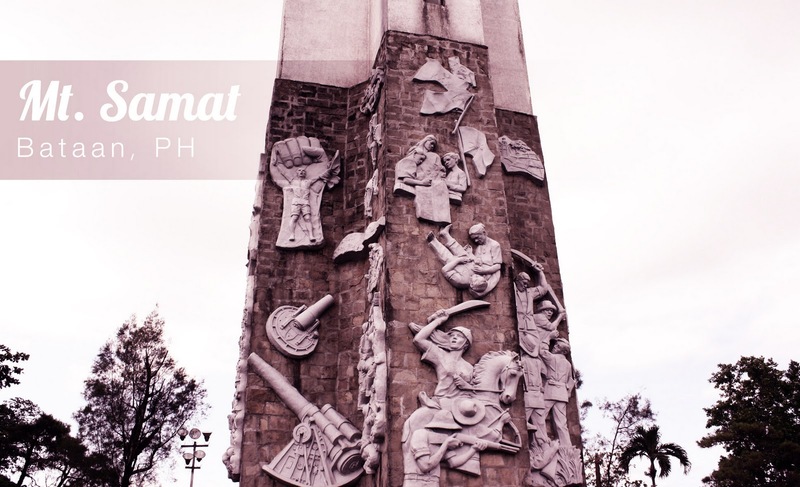 FUN FACT: The elevator inside the Memorial Cross is almost half-century old and is believed to be one of the first ten elevators installed in the Philippines. The other ones had already retired a few years back, of which can be found inside UP Diliman and UP Los Baños. One can even see the Bataan Nuclear Power Plant at Morong, which is approximately an hour drive from Pilar. The Colonnade is a marble-covered structure surrounded by esplanade (Wiki, 2011). The esplanade is surrounded by marble covered parapets with the outer side covered with 19 high relief sculptures by National Artist Napoleon Abueva depicting images of the war alternating with 18 bronze insignias of USAFFE Division units made by Talleres de Maximo Vicente, Leonides Valdez, and Angel Sampra and Sons. Each bronze insignias has a flagpole for the flags of each division. There were even four large chandeliers made of bronze that hung from the ceiling of the building! The Colonnade, with Jay as my trusty tour guide! We visited the underground museum and finally had a grasp of what really happened during the Fall of Bataan. Like any other museums, picture taking is not allowed inside. There were so many relics, photos and even vintage stuff inside the museum. Entrance fee by the way is only Php 20. A narrative about the Battle of Bataan was inscribed in marble on two lateral walls of the Colonnade. Reading those inscribed narratives gave me goosebumps. I salute those brave soldiers of ours who fought for our country during World War II. They have made a lot of sacrifices and endured a lot of things - from the infamous Death March to the most brutal forms of torture given by the Japanese soldiers. Even though I don't belong to their generation, I would still (and always) pay homage to them by not forgetting this particular part of the Philippine history. The great men of valor fought for our country. Bataan is one of my favorite places because of its unexplored coves. The beach may not compare to those of Boracay or Pagudpud but they provide some of the best opportunities for landscape photography. Glad you had great time there :) Happy New Year. 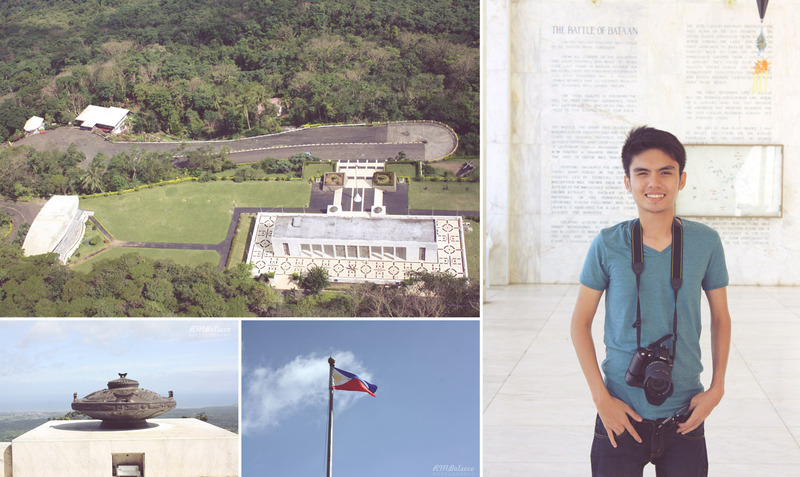 Gusto ko rin sanang i-explore ang Corregidor Island pero kulang na ng time. :( Oh, thanks for the tip, Oman! :) Happy New Year rin sa 'yo! Good job, Renz! Singapore on January? HAHAHA. Hapy holidays! I wish I could also visit that Cross. I have been wanting to go there since my Grade VI teacher told us about Mt. Samat. ^_^ Nice photos you got there. Mt. Samat is my first mountain trip but I don't consider it as a hiking journey. Were you able to get on top of the cross?